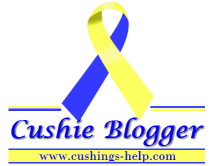 From what I understand from the support groups, message boards, websites, etc., most people fight for a Cushing's diagnosis for years before they are actually diagnosed by a doctor. For this reason, along with how hard it is to test for Cushing's and get accurate results, I think the amount of people who have Cushing's is greatly underestimated. Almost 36% of American adults are obese. I'm sure more than 1 in 100,000 people may have Cushing's. I see people all the time on the street that have the obvious Cushing's body type - normal sized arms and legs, bigger torso, with disproportionately fat face. Once you know what you're looking for, it's easy to spot. Not all of these people have Cushing's, but I would bet that half of them do, and just don't know it. Because Cushing's is hard to diagnose, especially with the obesity epidemic in America, if you go to the doctor complaining of weight gain, they will immediately tell you to diet and exercise. When that doesn't work, it's easy to give up and ignore the other symptoms like hypertension, diabetes, stretch marks, acne, and kidney stones and blame them on a poor diet or just on the fact that you're obese. Once you get a doctor to believe there's a chance that you may have Cushing's, you run into the problems associated with testing for Cushing's. You may do the old standard dexamethasone suppression test, 24 hour Urine free cortisol tests, maybe even midnight salivary tests. One of these tests on it's own tells doctors nothing, but they may tell you because one test is negative, you don't have Cushing's. Many of the endocrinologists that specialize in Cushing's know that it takes many tests over a period of a few months to really gather enough data to have a diagnosis. I tested for Cushing's Disease for 3 years before I had a test that was abnormal, and I had full blown Cushing's, with horrible symptoms. I think there aren't enough primary care physicians, pediatricians and internists that know enough about Cushing's to test for it in patients that have uncontrolled hypertension or uncontrolled diabetes. If I could go around and tell all of them my story, along with others that have gone through this horrible disease, maybe they would know enough to at least refer these people to an endocrinologist. I hope there will someday be better diagnostic tools to catch Cushing's disease earlier, and in more people before they even have symptoms. For now, maybe some general education will help those out there who may not even know they're sick.